Van Ness Auto Waterer is perfect if you are going away for a few days' and want your pet to have continuous access to clean drinking water. The waterer comes in different sizes for small to large dogs and cats. Van Ness Auto Waterer comes in 1.5 liters, and 6 liters. 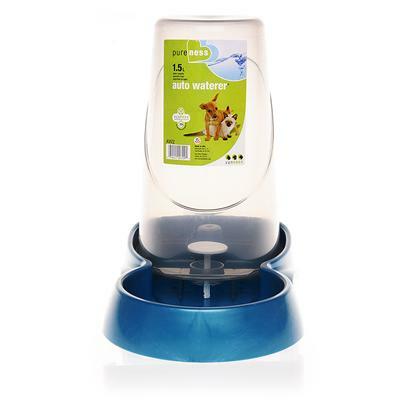 The product stores clean water for the pet, when the owner is away for a few days', dispensing drinking water as per the pet's needs. Van Ness Auto Waterer comes with a spill-less valve, so there is no mess and leaking. It has a removable top and hence it can be easily cleaned, and is also dishwasher-friendly. The top is done in clear smoke finish plastic for easy viewing of water quantity in the container. The water dish is large and stores sufficient water. Additionally, the waterer comes with interlocking nesting for efficient shelf space utilization and shipping. Pour water manually into the top pitcher, and fix it on the bottom container. The handles on the side assist in the process.